Five new state-of-the-art uni-link buses will be travelling round Southampton for the first time on Monday 29 September, marking the official start of the new ten-year deal between the University of Southampton and Eastleigh-based bus contractor Bluestar. The distinctively branded double deckers are the first arrivals of a new fleet of buses being rolled out under the contract as part of a £3 million investment in the award-winning service. Uni-link is the University's bus service, launched in 2001 and linking its campuses and halls of residence with Southampton General Hospital, the Docks and the city centre through four city-wide routes. More than three million passengers a year, including staff, students and the general public, use the network, making it one of the most popular in Southampton. Each new £160,000 high-specification bus features two doors and a powered wheelchair ramp. All five buses will travel along the uni-link U1 route. The flat fare of £1.50 per journey and smart card ticketing will continue. The introduction of the new vehicles coincides with Freshers' Week at the University which sees over 5000 new students arrive for the start of their studies in Southampton. Other double and single decker additions to the fleet will be arriving over the next few months. 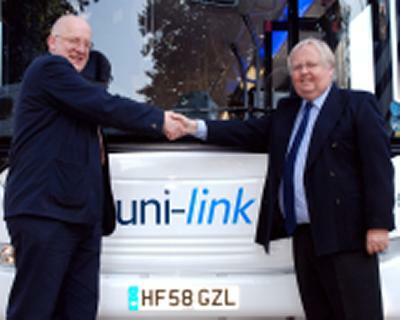 George Fair, uni-link operations manager, says: "We are delighted to introduce these new buses to the University's staff and students and to the Southampton travelling public. These new buses will provide all uni-link passengers with an even higher-quality service." The new uni-link timetables are now in operation and are available to download from the new website at www.unilinkbus.co.uk.